Fa-chao Zhi, MD from the Guangdong Provincial Key Laboratory of Gastroenterology; Department of Gastroenterology, Nanfang Hospital, Southern Medical University in Guangzhou, China discusses this Original Article ”Role of transgastric natural orifice transluminal endoscopic surgery in the diagnosis of ascites of unknown origin (with videos)” from the November issue. The purpose of this study was to evaluate the role of transgastric natural orifice transluminal endoscopic surgery (NOTES) in diagnosing patients with undetermined ascites. Ascites is a common sign in clinical practice and is presented by different kinds of disorders. However, ascites is of unknown origin in some patients in spite of comprehensive examinations, including imaging techniques (such as ultrasonography) and laboratory tests, and it is still difficult to make correct diagnosis prior to etiological treatment. 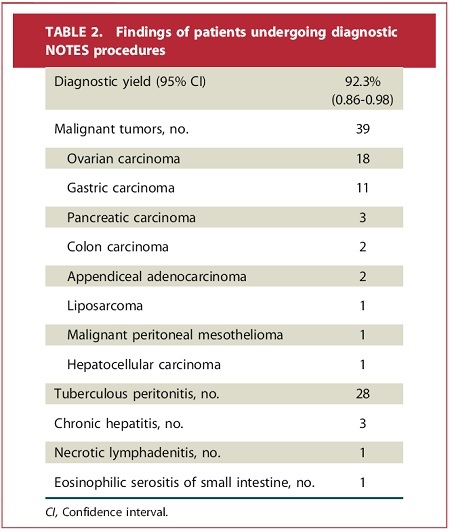 Transgastric NOTES, in combination with biopsy, provided a diagnosis in 92.3% (72 of 78) of patients. Various pathologies were diagnosed, including: malignant tumors (39 cases); tuberculous peritonitis (28 cases); chronic hepatic inflammation (3 cases); necrotizing lymphadenitis (1 case); eosinophilic serositis of the small intestine (1 case). This is a non-randomized control analysis. Our findings remain to be further confirmed by prospective multi-center randomized controlled trials; furthermore, this technique should be regarded as an experimental one until differently demonstrated by a prospective trial comparing it to alternative techniques like laparoscopy. Transgastric NOTES in combination with biopsy can elucidate the causes of ascites of unknown origin in the majority of cases. It is possible that NOTES could serve as a valuable modality to detect the cause of diseases with ascites of unknown origin. It has been selected as a Research Highlight in Nature Reviews Gastroenterology & Hepatology with comments from professor Patman Gillian.